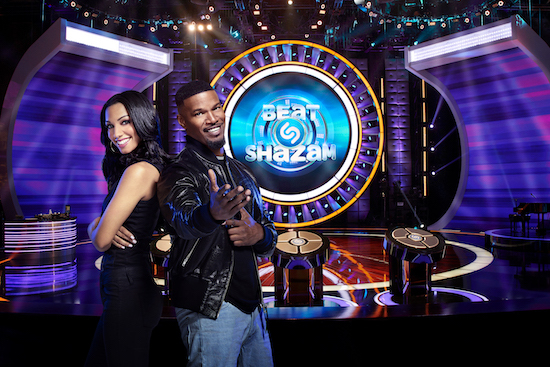 BEAT SHAZAM: L-R: Deejay Corinne Foxx and Host Jamie Foxx. CR: FOX. © 2018 FOX Broadcasting Co.
Fox has firmed up its summer plans. In addition to the previously announced PARADISE HOTEL (which will air three times per week), BEAT SHAZAM will return on Monday, May 20; MASTERCHEF’s tenth season kicks off on Wednesday, May 29; and SO YOU THINK YOU CAN DANCE (with judges Nigel Lythgoe, Mary Murphy, Laurieann Gibson, and Dominic “D-Trix” Sandoval) will return on Monday, June 10. Season 12 comes down to one moment for both Team Stage and Team Street. Find out which team’s dancer has won the hearts of the country and who will take the title of America’s Favorite Dancer. SO YOU THINK YOU CAN DANCE celebrated a decade of being on the air with a special hour on Tuesday. (The actual anniversary fell on July 20th — the day of the show’s regularly scheduled episode.) In addition to clip packages of what the series has done over its first ten years, many of the show’s former contestants came back to perform some of the most memorable routines, so far. SO YOU THINK YOU CAN DANCE is bringing back a few familiar faces for its 12th season — Stephen “tWitch” Boss and Travis Wall will serve as mentors, Fox announced. The mentorships will come into play starting with the Las Vegas callbacks round. The stage dancers (mentored by Travis) will consist of styles such as contemporary, ballet, jazz, or tap. The street dancers (mentored by tWitch) will consist of styles such as hip-hop, animation, or breaking. SO YOU THINK YOU CAN DANCE is losing one of its most familiar faces: Mary Murphy will not be returning for the series’ upcoming 12th season. SO YOU THINK YOU CAN DANCE will return for a 12th season, but the show will be shaken up a bit. Did you miss the performance? Check out Moore’s moves now! It might be SO YOU THINK YOU CAN DANCE finale night, but the upcoming winners aren’t the only ones getting good news: executive producer/judge Nigel Lythgoe just announced during the live broadcast that Fox has renewed the series for an eleventh season. Are you excited to get more of SYTYCD? In Case You Missed It…BONES, SO YOU THINK YOU CAN DANCE, THE VOICE, and More! Comments Off on In Case You Missed It…BONES, SO YOU THINK YOU CAN DANCE, THE VOICE, and More! BONES: Two More Season 9 Promos Released! GLEE Season 5 Promo: New Footage of The Beatles Tribute! Watch THE GOLDBERGS Pilot Now! Have You Been Waiting to Catch Up on THE GOOD WIFE? Now’s Your Chance! ‘We Have Thoughts’ Vodcast: Danielle and Marisa Talk About WHODUNNIT?